Armenian as well other people around the world paid homage to the memory of 1.5 million innocent victims of the 1915 Armenian Genocide implemented by the Ottoman Empire. 98 years after the Genocide the present Turkish nation not only deny that its predecessors plotted and committed the Genocide, but also continues its anti-Armenian policy, still retaining confiscated church estates and properties, and religious and cultural treasures of the Armenian people. Different views about history have their impact also today when the frozen conflict of Artsakh, better known as Nagorno-Karabakh, still waits its solution. Nineteen years after the ceasefire in 1994, an agreement between Armenia and Azerbaijan is still not reached and the Nagorno-Karabakh Republic continues its existence as a de facto independent republic recognized by no other state. The First Balkan War, which lasted from October 1912 to May 1913, pitted the Balkan League (Serbia, Greece, Montenegro and Bulgaria) against the Ottoman Empire. The combined armies of the Balkan states overcame the numerically inferior and strategically disadvantaged Ottoman armies and achieved rapid success. The Balkan Wars resulted in a defeat of the Ottoman Empire and the loss of 85% of its territory in Europe which were and partitioned among the allies. An important consequence of the Balkan Wars was also the mass expulsion of Muslims from the Balkans. Already beginning in the mid-19th century, hundreds of thousands of Muslims were expelled or forced to flee from the Caucasus and the Balkans as a result of the Russo-Turkish wars and the conflicts in the Balkans. Muslim society in the empire was incensed by this flood of refugees and overcome by a desire for revenge. After the Balkan Wars (1912-13) the Turkish nationalist movement in the country gradually came to view Anatolia as their last refuge. That the Armenian population formed a significant minority in this region would figure prominently in the calculations of the Young Turks who would eventually carry out the Armenian Genocide. During the First World War, the Turkish authorities accused Armenians of sympathizing with Russia and used it as a pretext to declare the entire Armenian population their enemy. The Armenian Genocide, also known as the Armenian Holocaust, the Armenian Massacres and, among Armenians, the Great Crime was the Ottoman government’s systematic uprooting and extermination of its minority Armenian population from their historic homeland in Turkey. The starting date of the genocide is conventionally held to be April 24, 1915, the day when Ottoman authorities arrested and massacred some 250 Armenian intellectuals and community leaders in Constantinople(Istanbul), on orders from the Turkish government. Tragic events took place during and after World War I, in two phases: the wholesale killing and enslavement of the able-bodied males, and the deportation of women, children, the elderly and infirm on death marches to the Syrian Desert. In addition women and children were placed on boats and drowned at sea, or crucified. There is also evidence that children were put to death with poison gas in schools that were converted to death camps. The total number of Armenians killed as a result is estimated at between 1 and 1.5 million in period of 1915-1923. Armenia claims that the total number of dead exceeds 1.5 million people, the half of all Armenians at the beginning of the last century. The Assyrians, the Greeks and other minority groups were similarly targeted for extermination by the Ottoman government, as part of the same genocidal policy. It is considered by many to have been the first modern genocide, due to the organized manner in which the killings were carried out to eliminate the Armenians. However the Armenian Genocide can also be seen otherwise, not as having begun in 1915, but rather as an ongoing genocide, from 1894, through 1908/9, through World War I and right up to 1923. For example 200,000-300,000 Armenians were massacred in Turkey on period 1894-1896. Genocide is the organized killing of a people for the express purpose of putting an end to their collective existence. Because of its scope, genocide requires central planning and a machinery to implement it. This makes genocide the quintessential state crime as only a government has the resources to carry out such a scheme of destruction. The Armenian Genocide was centrally planned and administered by the Turkish government against the entire Armenian population of the Ottoman Empire, it was carried out during WWI between the years 1915 and 1918 and the atrocities were renewed between 1920 and 1923. In recent years, parliaments of several countries have formally recognized the event as genocide. Turkish entry talks with the EU were met with a number of calls to consider the event as genocide though it never became a precondition (so far). The fact of the Armenian Genocide is recognized by many states. It was first recognized in 1965 by Uruguay. 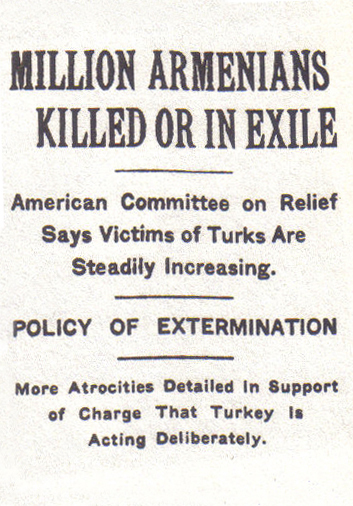 In general, the Armenian Genocide in Ottoman Turkey has already been recognized e.g. by Russia, France, Italy, Germany, the Netherlands, Belgium, Poland, Lithuania, Slovakia, Switzerland, Sweden, Greece, Cyprus, Lebanon, Canada, Venezuela, Argentina, and 42 U.S. states. Armenian Genocide was recognized also by the Vatican, European Parliament and the World Council of Churches. The position of Israel is most interesting or even ambivalent as the Jews have first hand experience about genocide/holocaust. From my perspective more than any other nation, Israel has the moral obligation to recognize the Armenian Genocide. On November 7, 1989 the Union for Reform Judaism passed a resolution on recognition of Armenian Genocide. This year the Knesset held a ceremony to mark the memory of the Turkish genocide of Armenians. MK Reuven Rivlin (Likud) said before the ceremony that he believes that “as human beings and as Jews, we must not ignore the catastrophe of another nation for any reason, including diplomatic considerations, important as they may be. We will mark the annual memorial day for the massacre of the Armenian people regardless of the relations with today’s Turkey, which is an ally.” Turkey was of course highly displeased with the Knesset’s decision to mark the day. Various events devoted to the subject, which were supposed to be held at the Knesset, were cancelled in recent years because of Turkish pressure. Anyway Israel progressing with this issue as the Knesset’s Education Committee will hold a discussion on Monday (29th Apr.2013) regarding two initiatives presented by Members of Knesset Professor Arieh Eldad (Hatikva) and Zehava Gal-On (Meretz) to recognize the Armenian genocide 1915. Kurdish recognition of the Armenian Genocide is the recognition of the Kurdish participation in the ethnic cleansing of Armenians during WWI, when Kurdish tribal forces attacked and killed Armenian civilians and refugees. In several of the Kurdish regions, the Kurds participated in the genocide of the Armenians while others opposed the genocide, in many cases even hiding or adopting Armenian refugees. 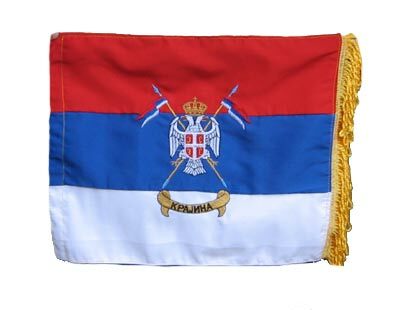 On 2010 the Serbian Radical Party submitted a draft resolution to the Serbian parliament condemning the genocide committed by Ottoman Turkey against Armenians from 1915 to 1923. SRS submitted the draft so that Serbia can join the countries which have condemned the genocide. At the end of 2011, the Serbs in Bosnia started an initiative to make Armenian genocide denial illegal. Turkey has consistently denied responsibility for the genocide, which is sometimes referred to as the Armenian Holocaust. Azerbaijan, being in deep strategic alliance with Turkey and in a state of war against Armenia, shares the position of Turkey. Some countries, including Argentina, Armenia, Slovakia, Slovenia, Switzerland and Uruguay have adopted laws that punish genocide and also in October 2006, the French National Assembly passed a bill which will make Armenian Genocide denial a crime. Last week, France ratified a bill in parliament, according to which denying the 1915 Armenian genocide would be punishable by a jail sentence of up to one year and a 45,000 Euro fine. The bill has yet to receive final approval in the French senate. Docent of the Plekhanov Russian University of Economics Alexander Perinjiyev believes that the war between Armenia and Azerbaijan is inevitable. Moreover, Perinjiyev predicts when Azerbaijan will open hostilities. It would be logical if this military campaign would start immediately after the Olympic Games in Russia’s Sochi. Old ethnic tensios take place in region also today. Artsakh was the tenth province of the Kingdom of Armenia from 189 BC until 387 AD. Much of historical Artsakh presently overlaps with the region of Nagorno-Karabakh. Populated for centuries by Christian Armenian and Turkic Azeris, Karabakh became part of the Russian empire in the 19th century. The conflict has roots dating back well over a century into competition between Christian Armenian and Muslim Turkic and Persian influences. The conflict started in 1989, when the Nagorno Karabakh Autonomous Oblast, a predominantly Armenian territory within Soviet Azerbaijan, declared its independence from Azerbaijan and union with Armenia. The resulting tension between the Armenian and Azerbaijani residents soon turned into an ethnic conflict and finally to the 1991–1994 Nagorno-Karabakh War, which ended with a ceasefire that left the current borders. As the Azeris in Armenia, Nagorno-Karabakh, and surrounding territories fled to Azerbaijan, the Armenians in Azerbaijan moved to Armenia proper. The total number of displaced people is estimated to be one million. Today, Nagorno-Karabakh is a de facto independent state, calling itself the Nagorno-Karabakh Republic. It is closely tied to the Republic of Armenia and uses the same currency, the dram. On the other side according to reports as yet unconfirmed Turkey still trains Azerbaijani soldiers in Turkey for the purpose of attacking Armenia. The political situation in region is quite confusing. Armenia accounts for the Russian military base. Russia sponsors Armenia, actively supports it in many issues one can say that the relations between Moscow and Yerevan have reached the level of allied partnership. It is clear that Russia would not want to lose such an important ally in such a serious and potentially explosive geopolitical region. Azerbaijan has close military ties with NATO member Turkey. Iran, which borders both, is the biggest wildcard; although Shiite Muslim like Azerbaijan, Tehran reviles Baku because of Azerbaijan’s secular orientation, its close ties with Israel, and fears about separatist tendencies among Iran’s large Azeri minority. Iran, ironically, has far better ties with Christian Armenia. Turkey closed its border with Armenia in 1993. Israel has been developing closer ties with Azerbaijan and have helped modernize the Armed Forces of Azerbaijan. It is claimed that with this cooperation Israel has ”bought” an airport for planned strike against Iranan nuclear facilities. On the other hand Armenian-Jewish relations date back to the time of Armenian emperor Tigranes the great , who, retreating from Judea, took 10,000 Jews with him on his return to the Kingdom of Armenia. Israel itself is home to the Armenian Quarter of the Old City of Jerusalem. The final status of Nagorno-Karabakh is a matter of international mediation efforts of the OSCE Minsk Group, co-chaired by Russia, France and the United States. At present, the mediation process is at a standstill. Azerbaijan’s position has been that Armenian troops withdraw from all areas of Azerbaijan outside Nagorno-Karabakh and that all displaced persons be allowed to return to their homes before the status of Karabakh can be discussed. Armenia does not recognize Nagorno-Karabakh as being legally part of Azerbaijan, arguing that because the region declared independence at the same time that Azerbaijan became an independent state, both of them are equally successor states of the Soviet Union. The Armenian government insists that the government of Nagorno-Karabakh be part of any discussions on the region’s future, and rejects ceding occupied territory or allowing refugees to return before talks on the region’s status. Who Gets Justice From ICTY? Finnish leading daily newspaper – Helsingin Sanomat – published today (14/04/2013) an investigative feature story Winners Justice related to recent release of Croatian war criminal Ante Gotovina. Gotovina was responsible about biggest ethnic cleansing during Balkan wars. The article clearly proves the political and biased nature of International Criminal Tribunal for the former Yugoslavia (ICTY). 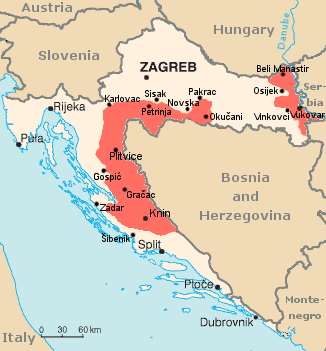 Ante Gotovina was leading sc Operation Storm against Serb populated Krajina region. Krajina had been under UN protection from 1992, however some 10,000 UN peacekeepers could not stop the attack against civilians – three peacekeepers was murdered and over 200,000 Serbs escaped to Serbia. Croatian army looted homes of Serbs and burned most of them (about 17,000) down. Few thousands old or handicapped Serbs could not flee and hundreds of them were found later decapitated, burned or executed. More about operation Storm and ethnic cleansing in Krajina in my articles Krajina – Victory with Ethnic Cleansing and Operation Storm – forgotten pogrom. The operation “Storm” successfully finalized the ethnic cleansing of the Republic of Serbian Krajina. Croat president Franjo Tudjman cynically described the pogrom of Croatia Serbs at the opening of the Military school Ban Josip Jelacic in Zagreb, on December 14 1998: “We have, therefore, resolved the Serbian question! There will no longer be 12 percent of Serbs, nor 9 percent of Yugoslavs, as before. One may find some equivalence between terms of Serbian question and Jewish question and not by coincidence as Mr.Tjudman is a widely acclaimed Holocaust denier and international hero to Neo-Nazis. ICTY started to investigate war crimes and ethnic Krajina’s cleansing immediately 1995. U.S. – who was the main financier of ICTY – tried at daily basis to stop investigations and when they however continued U.S. refused to submit satelite photos and other evidencies in their possession to prosecutor. Despite all this sabotage ICTY anyway had enough evidence against Gotovina; after years of hiding he was arrested on 2005 – maybe because his arrest was one preconditition for Croatia’s EU membership. Gotovina got sentence of 24 years in Hague. However ICTY Appeals Chamber released him on Nov. 2012. The obvious reason for outcome Ante Gotovina’s trial from my perspective is that operation Storm was implemented by help of U.S. All the procedure manifests that ICTY is a political construction to implement U.S. will, to whitewash actions and war crimes implemented by U.S. and their allies and to demonize Serbs to get justification for U.S. intervention to Balkan wars. The dominating political aspect casts shadows also the earlier court decisions – whether accused were acquit or not as well throws suspicion on ongoing trials in Hague. The Syrian rebellion began in earnest on March 11, 2011, when protests erupted. Since then, the Syrian civil conflict has become increasingly violent. About 70,000 people have died in the country’s civil war over the past two years. Millions of people have been displaced, both internally and abroad. For months regional and Western capitals have officially held back on arming the rebels, in part out of fear that the weapons would fall into the hands of terrorists. Now however U.S. has begun to support arms delivery to Syrian opposition with recycling its old practice in Balkans. Multiple planeloads (some estimates are up to 160 cargo-planes, 3,500 tn) of weapons have left Croatia since December 2012, when many Yugoslav weapons, previously unseen in the Syrian civil war, began to appear in videos posted by rebels on YouTube. Saudi Arabia has financed a large purchase of infantry weapons from Croatia and quietly funneled them to anti-government fighters in Syria. American intelligence officers have helped the shipment with their earlier practice during Balkan wars. Earlier compared with the heavy weaponry employed by the Syrian regime, most of the equipment of Free Syrian Army (FSA) has been light so now the game is changing. Some foreign arms have been making their way to the Syrian opposition; the vast majority of guns were bought right from the regime – corrupt regime officials sold them. Another portion of their weapons was bought off the black market from Turkey or Jordan, which made them very expensive. The opposition began as a secular struggle to overthrow the Assad regime. But many of the loosely linked brigades fighting the Assad regime have incorporated Islamist aims into their mission. These groups range from moderately Islamist outfits such as Liwaa al-Tawhid to more conservative groups such as Ahrar al-Sham, whose members have called for the countrywide implementation of Shariah, or Islamic law. There are also jihadist groups such as Jabhat al-Nusra (JAN), which operates as an extension of al Qaeda’s Iraqi franchise and has been declared a terrorist organization by the U.S. JAN boasts foreign connections and members with years of fighting experience, making them invaluable to the uprising. The M79 Osa, an anti-tank weapon of Yugoslav origin, seized from Syria’s opposition. Persian Gulf states such as Qatar and Saudi Arabia have been orchestrating weapons shipments into the conflict for months. Weapons from the former Yugoslavia were spotted in Syria this winter, after a series of military cargo flights from Zagreb to Amman. The arms are typically sent to Turkey and shipped into Syria via ground transport. The airlift, which began on a small scale in early 2012 and continued intermittently through last fall, expanded into a steady and much heavier flow late last year, the data shows. It has grown to include more than 160 military cargo flights by Jordanian, Saudi and Qatari military-style cargo planes landing at Esenboga Airport near Ankara, and, to a lesser degree, at other Turkish and Jordanian airports. Also from Jordan and Turkey, trucks take the weapons to the border with Syria. The anti-Assad front is not like-minded: Riyadh – and Prince Bandar in particular – accuses the Qataris of conspiring to bring the Muslim Brotherhood to power in Damascus, including radical groups tied to Al Qaeda. Qatari Prime Minister and Secret Service Chief Sheikh Hamad bin Jassem has shot back with the charge that Saudi Arabia is maneuvering for control of the Syrian rebel movement. The below video posted by the jihadist group Ahrar al-Sham, a collection of various smaller groups based in the north of Syria, mainly around Idlib, Aleppo, and Hama, and not part of the Free Syrian Army, demonstrates that the Yugoslavian weapons – supplied via Croatia – being provided to FSA have now begun to reach the hands of jihadists. These include RBG-6 40mm grenade launcher , the M79 Osa rocket launcher, M79 rocket pods, Yugoslav-made recoilless gun, as well as other assault rifles, grenade launchers, machine guns, mortars and shoulder-fired rockets for use against tanks and armored vehicles. One should add that Croatia’s Foreign Ministry and arms-export agency has denied that such shipments had occurred. Croatia, poised this year to join the European Union, now strictly adheres to international rules on arms transfers. However, export figures obtained by the Organized Crime and Corruption Reporting Project (OCCRP) show that last December, Jordan suddenly began buying Croatian weapons. 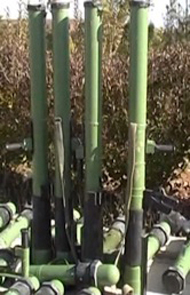 On March 2013 Syrian rebels in Aleppo have begun receiving their first heavy weapons – 220-mm MLRS rocket launchers – from a large-scale supply operation headed by Saudi intelligence chief Prince Bandar bin Sultan. According Debkafile in Serbia, Bosnia, Croatia and Kosovo, his agents produced snapped up Russian-made MLRS (Smerch) and Hurricane 9K57 launchers capable of firing scores of 220-mm rockets to a distance of 70 kilometers. I have some doubts how this Russian made MLRS has came from Croatia. First only one source (Debkafile) indicates so, second I don’t have any confirmation that this system was for sale in Balkans, third some youtube videos from Syria which I have seen about this MLRS are so unclear that the question could be about some similar type of MLRS. Image shows a M60 recoilless gun (YU) being used to attack an army outpost,Hajez Barad, in Busr al-Harir, Daraa, on March 2nd. The Saudi operation for shipping heavy rocket launchers from the Balkans to Aleppo is complicated. The rockets are fixed to vehicles weighing 43.7 tons each. The rockets themselves are 7.6 meters long and weigh 800 kilograms. To arrange the transfer of this heavy artillery to the rebels in Aleppo, Prince Bandar contacted Hakan Fidan, head of the MIT-Turkish National Intelligence Organization. They agreed to set up an overland route from the Balkans via Turkey and across the Syrian border to Aleppo, under the protection of the Turkish army. It may be that Syrian rebels have now also the BM-30 Smerch (tornado), the most powerful multiple launch rocket system (MLRS) in the world. It was developed in the early 1980s and was accepted to service with the Soviet Army in 1987. It is also in service with Belarus and the Ukraine, and has been exported to Kuwait (27 systems) and Algeria (18 systems).India placed an order for an initial 38 systems. Deliveries began in May 2007. Former Yugoslavia had three types of MLRS: M 63 Plamen(32 /128),M 77 Ogan(32/128) and M 87 Orkan(12/262) which was produced in cooperation with Iraq and army of Iraq used this system. 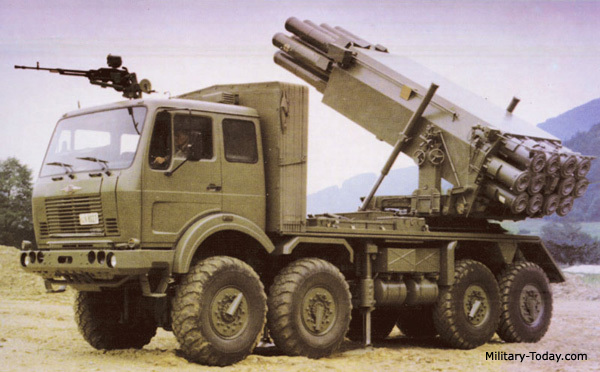 The M87 Orkan (hurricane) is a MLRS, jointly developed by Yugoslavia and Iraq. Most of development was made in Yugoslavia and some manufacturing took place in Iraq. It was first publicly revealed in 1988 during defense exhibition in Iraq, labeled as the Ababil-50. The Orkan MLRS project was finished in the early 1990s due to collapse of the Yugoslavia and it is estimated that only few system were built. The most modern – 2011 – MLRS in Balkans is LRSVM, which is a modular self-propelled multitube rocket launch system developed by Serbia-based Vazduhoplovno Tehnicki Institut (VTI). Also Abu Dhabi’s Emirates Defense Technologies (EDT) has developed, manufactured and delivered the first unit of the MLRS, which was designed and manufactured locally in UAE but in collaboration with a leading Serbian defence contractor. Perhaps some of these are now in operation theatre. On the other hand Russia brings down its cargo planes loaded with weapons and replacement parts for the Syrian army at Nairab air base attached to Aleppo’s international air port, after the air facilities around Damascus were targeted by rebel fire. Recently Russian and Iranian arms lifts to Nairab were doubled, after rebels seized many Alawite villages in the Aleppo and Idlib regions of northern Syria. The Saudis hope to expedite the rebel capture of the big Syrian Nairab air base attached to Aleppo’s international air port. The Saudi prince has personally taken the Nairab battle under his wing, convinced that it is the key to the conquest of Aleppo, once Syria’s national commercial and population center, after more than a year’s impasse in the battle for its control. The fall of this air base would also substantially reduce the big Iranian and Russian airlifts to Assad’s army. Moscow has since warned the rebels that if they attack incoming or outgoing Russian planes at Nairab, Russian special forces will come in to wipe out their strength around the base and take over its protection themselves. It is not surprising that U.S. is using Croatia for its clandestine operations. Radical Islam has enforced and widened their activities in Balkans last 15 years. 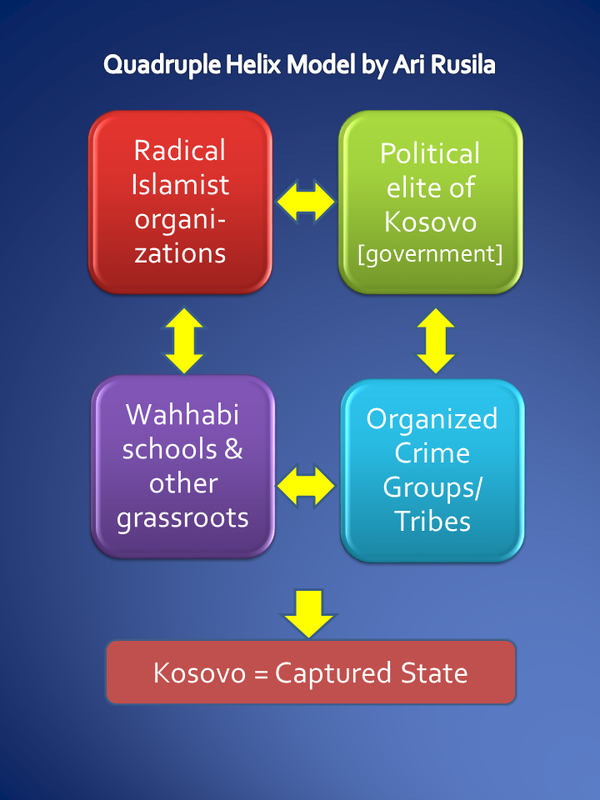 During Bosnian war many foreign Islamists came to fight in mujahedeen brigade also many Al Quida figures – including Osama bin Laden – were supporting Bosnian Muslims 1990’s. US took the side with these “freedom fighters” in Bosnia and later in Kosovo. US involvement in the Balkans is not about helping any of the people in the region — Muslims, Croats, Serbs, or Albanians. The only interest of the Pentagon is in creating weak, dependent puppet regimes in order to dominate the entire region economically and politically. In the 1980s Washington’s secret services had assisted Saddam Hussein in his war against Iran. Then, in 1990, the US fought him in the Gulf. n both Afghanistan and the Gulf, the Pentagon had incurred debts to Islamist groups and their Middle Eastern sponsors. By 93 these groups, many supported by Iran and Saudi Arabia, were anxious to help Bosnian Muslims fighting in the former Yugoslavia and called in their debts with the Americans. Bill Clinton and the Pentagon were keen to be seen as creditworthy and repaid in the form of an Iran-Contra style operation – in flagrant violation of the UN Security Council arms embargo against all combatants in the former Yugoslavia. One could add that Ayman al-Zawahiri, later the leader of al Qaeda, came to America to raise funds in Silicon Valley for Bosnian jihadists.in 1993, Mr. bin Laden had appointed Sheik Ayman Al-Zawahiri, to direct his operations in the Balkans. The recent history of this issue in Balkans started in June 1993, when President Clinton received the head of the Saudi Arabian intelligence service, Prince Turki al Faisal – a close adviser to his uncle, the King. The Prince urged Clinton to take the lead in the military assistance to Bosnia. The American administration did not dare to do so: the fear of a rift within NATO was too great. However, the United States did consider the Saudi Arabian signal to be important, and therefore a new strategy was elaborated. Its architect was to be Richard Holbrooke, who started to look for a way to arm the Bosnian Muslims. In the summer of 1993, the Pentagon was said to have drawn up a plan for arms assistance to the Bosnian Muslim Army (ABiH), which included supplies of AK-47s and other small arms. This operation was to demand almost three hundred C-130 Hercules transport aircraft flights.The first consignment from Iran landed in Zagreb on 4 May 1994, with sixty tons of explosives and military equipment on board. The arms were transported in Croatian army trucks along the Adriatic coast to Bosnia. Because the supplies attracted too much attention at Pleso Airport in Zagreb, the flights subsequently went mainly to the Croatian island of Krk. Shortly after Iranian cargo aircraft had landed there, a number of Croatian helicopters arrived to continue transporting the load after dusk. Besides weapons the arrival in the Balkans of the so-called Afghan Arabs, who are from various Middle Eastern states and linked to al-Qaeda, began in 1992 – mujahedeen fighters who travelled to Afghanistan to resist the Soviet occupation in the 1980s later migrated to Bosnia hoping to assist their Islamic brethren in a struggle against Serbian Croatian forces. The pattern of U.S. collaboration with Muslim fundamentalists against more secular enemies is not new.In both cases all sides committed atrocities, and American intervention in fact favored the side allied with al-Qaeda. Similarly the cause of intervention was fostered by blatant manipulation and falsification of the facts. Reports of a chemical weapon attack in Syria’s Aleppo Province end of March 2013 provoked leaders and politicians, particularly in the West, to advocate more fiercely for the overthrow of the Assad regime, despite the vague details surrounding the attack. Current data seem to suggest, however, that it was not government forces behind the attack, but rebel forces.The attack, intelligence sources appear to agree, was launched by rebel fighters and not government forces. Since the victims were overwhelmingly the Syrian military, this was not a huge shock, but is important to reiterate. Likewise, the Assad forces called upon the United Nations to launch an investigation into the attack. Last October, the rebel forces were responsible for four suicide bombings in Aleppo that killed approximately 40 civilians and wounded many more. Jebhat al-Nusra, a group linked to al-Qaeda, has taken credit for the bombings. Additionally, the rebels were also responsible for the massacre of over 90 people in Houla last year. Immediately following that event, the U.S., France, Great Britain, and Germany blamed Assad for the killings and expelled Syria’s ambassadors from their countries in protest. Later reports, however, pointed to evidence that the massacre was in fact carried out by anti-Assad rebel forces. From the other side Iranian supplies are what keep Assad’s army functioning and his regime in Damascus and other Syrian towns able to survive the rebellion. Iraqi Al Qaeda is also preparing to push trucks loaded with Chlorine gas-CI trucks into Syria for the jihadists to use against Assad’s forces. U.S. has been unable to persuade Iraq cut short the Iranian airlift and land route through his country to Bashar Assad of weapons, fighters and cash. From my point of view it remains to see if this newest U.S. clandestine recycling operation has better success that earlier in Balkans, Afghanistan, Iraq, Libya … I doubt. 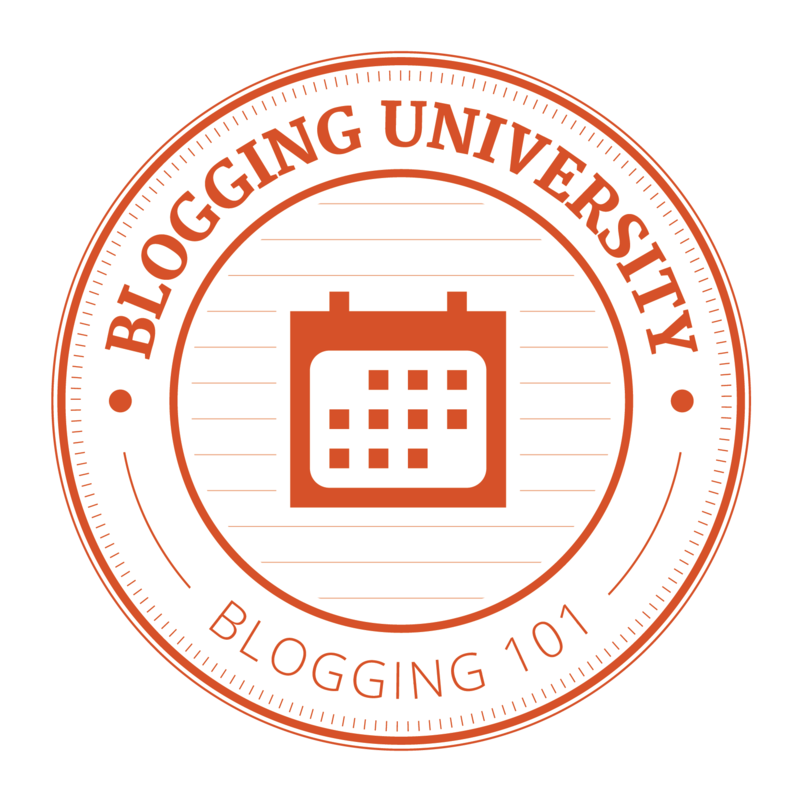 You are currently browsing the Conflicts by Ari Rusila blog archives for April, 2013.